At the Centraide Solidaires awards ceremony on April 9, HEC Montréal was presented with the Coup de cœur (“Public Sector Campaign” category), for the strong increase in its participation rate, the incredible leap in the number of Leader donors, the generous involvement of its management team, and for arranging for 25 presentations by agency speakers to be offered to over 500 employees—the combined effect of which boosted donations by 13%. HEC Montréal has been supporting the Centraide cause for many years now. 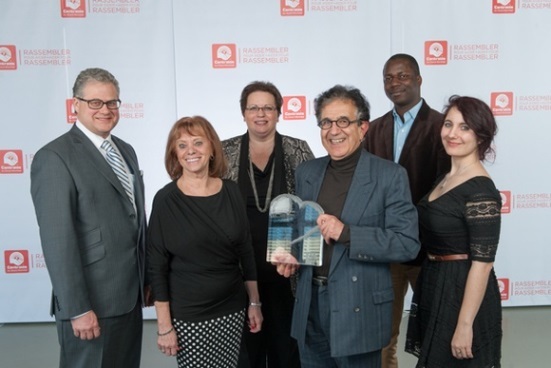 The 2013 campaign at the School, chaired by Professor Jacques Robert (Information Technologies), raised over $122,000, thanks to the generosity of the HEC Montréal community. Jacques Robert, Diane Brousseau (Senior Secretary, Department of Management Sciences), Sylvie Lacroix (Talent Acquisition Support Officer, Human Resources Department), Taïeb Hafsi (Holder of the Walter-J.-Somers Chair in International Strategic Management), Saouré Kouamé (PhD student and Research Assistant for the Walter-J.-Somers Chair in International Strategic Management) and Andréa Monguilod (MSc student and Vice-President, Communications, Association des étudiants aux cycles supérieurs).